The popular notion about marriage and love is that they are synonymous, that they spring from the same motives, and cover the same human needs. Like most popular notions this also rests not on actual facts, but on superstition. Marriage and love have nothing in common; they are as far apart as the poles; are, in fact, antagonistic to each other. No doubt some marriages have been the result of love. Not, however, because love could assert itself only in marriage; much rather is it because few people can completely outgrow a convention. There are today large numbers of men and women to whom marriage is naught but a farce, but who submit to it for the sake of public opinion. At any rate, while it is true that some marriages are based on love, and while it is equally true that in some cases love continues in married life, I maintain that it does so regardless of marriage, and not because of it. On the other hand, it is utterly false that love results from marriage. 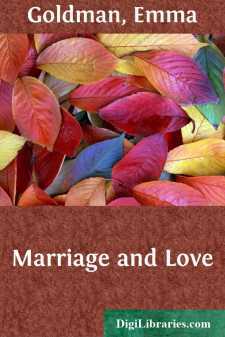 On rare occasions one does hear of a miraculous case of a married couple falling in love after marriage, but on close examination it will be found that it is a mere adjustment to the inevitable. Certainly the growing-used to each other is far away from the spontaneity, the intensity, and beauty of love, without which the intimacy of marriage must prove degrading to both the woman and the man. Marriage is primarily an economic arrangement, an insurance pact. It differs from the ordinary life insurance agreement only in that it is more binding, more exacting. Its returns are insignificantly small compared with the investments. In taking out an insurance policy one pays for it in dollars and cents, always at liberty to discontinue payments. If, however, woman's premium is a husband, she pays for it with her name, her privacy, her self-respect, her very life, "until death doth part." Moreover, the marriage insurance condemns her to life-long dependency, to parasitism, to complete uselessness, individual as well as social. Man, too, pays his toll, but as his sphere is wider, marriage does not limit him as much as woman. He feels his chains more in an economic sense. Thus Dante's motto over Inferno applies with equal force to marriage. "Ye who enter here leave all hope behind." That marriage is a failure none but the very stupid will deny. One has but to glance over the statistics of divorce to realize how bitter a failure marriage really is. Nor will the stereotyped Philistine argument that the laxity of divorce laws and the growing looseness of woman account for the fact that: first, every twelfth marriage ends in divorce; second, that since 1870 divorces have increased from 28 to 73 for every hundred thousand population; third, that adultery, since 1867, as ground for divorce, has increased 270.8 per cent. ; fourth, that desertion increased 369.8 per cent.